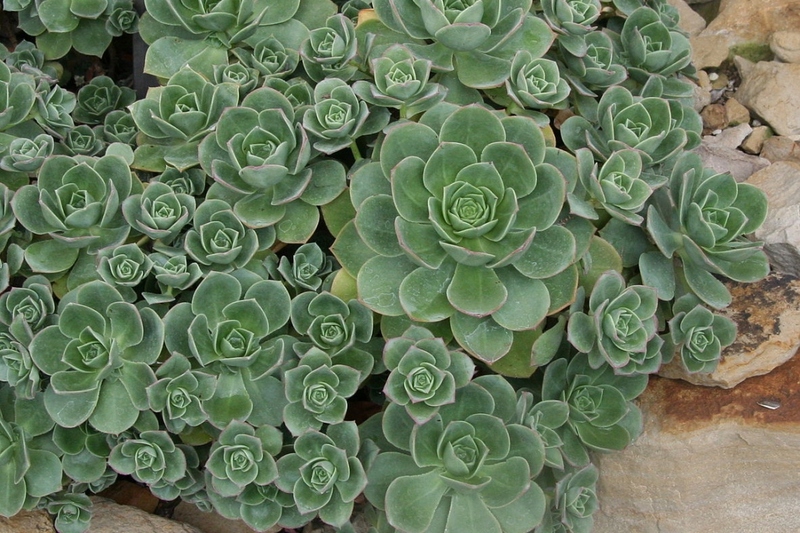 Haworth's aeonium (Aeonium Haworthii): growing, planting, caring. An easy-peasy succulent - and cute too ! Aeonium haworthii - Haworth's aeonium, or pinwheel - is a species of succulent flowering plant in the family Crassulaceae, native to the Canary Islands, where it grows on north-facing cliffs, and grown as a houseplant in temperate regions. It is a sand-dwelling beach plant, a subshrub with rough, woody stems and rosettes of thick, red-edged green leaves which are triangular or diamond- or spade-shaped. It grows to 60 cm, with panicles of cream-colored pointed flowers produced in spring. The cultivar 'Kiwi' is one of the most popular these days. 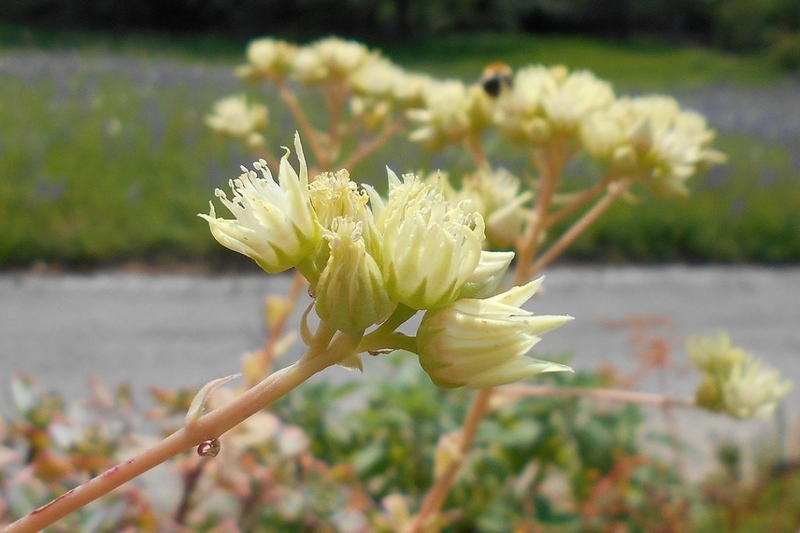 Typically a mild climate plant, the aeonium adapts especially well to the interiors of our homes and apartments. It develops well between temperatures of 18-22°C (slightly cooler in winter, if possible), and it needs light. Be careful nonetheless. Avoid placing the plant directly behind a window with too much sun exposure! It is possible to keep your aeonium outdoors if the temperatures in your area don't dip below 0°C. Otherwise, keep it inside! Your aeonium dislikes humidity, and its water needs are pretty limited — it stores everything it needs inside its thick leaves! During growth seasons (spring, summer), watering should be regular, about once or twice a month, but controlled, to make sure the roots don't rot. In autumn, gradually reduce watering until winter, when once-monthly watering will suffice. Never ! Your aeonium likes poor soils, really! Your aeonium multiplies very easily by cuttings. Take a twig of 7 to 10 centimeters, but sometimes a simple broken leaf can do the trick! Let it dry for a few days, then put it in a pot on the surface of a sand substrate or mix slightly damp soil / sand. Keep it in a room at about 20-25 ° C, and in a location with lots of light, but not in direct sunlight! Water moderately, allowing the surface of the substrate to dry between 2 waterings. After a few days, an identical seedling will appear at the base of the leaf: transplant the seedlings into another pot after about 3 months. 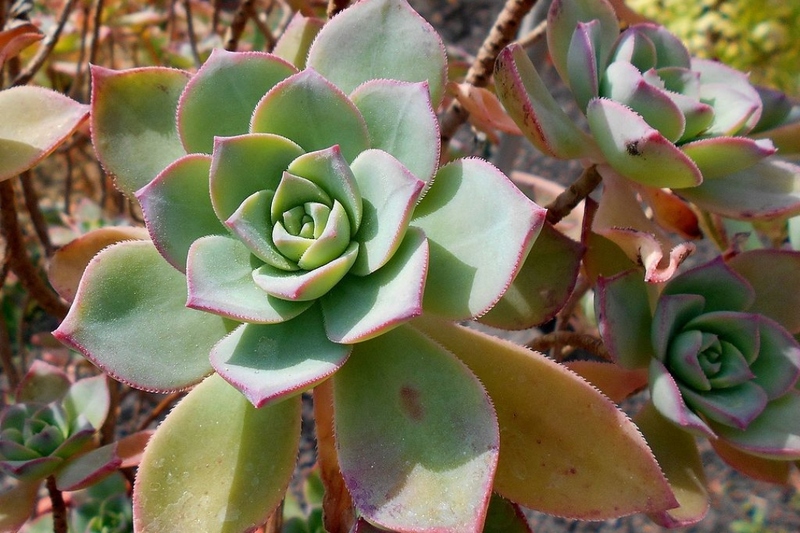 Aeonium is not very sensitive to diseases, except when it is watered a little too often. It can then be attacked by mealybugs or kermes, mildew or thrips. Mealybugs are sucking biting insects covered with a sort of waxy or powdery shell. If the leaves become sticky and become covered with sooty mold and the infected parts of the plant dry up, spray rapeseed oil to smother them. Thrips is a small, 1 to 2 mm pitting insect that appears in hot, dry weather, much like red spiders. A spray of water slightly soaped on the leaves at the first outbreaks may contain it. In all cases, check the frequency of your watering, and possibly the hygrometry of the room. Do not hesitate to take out your aeonium for the summer! Just avoid placing it directly in direct sunlight or in a situation with too little shelter - acclimatize it slowly, and of course, watch the watering! You should bring it inside at the end of the summer. Bring back your aeonium inside long before the first cool nights, ideally in a room not too heated so that it "feels" it is winter. You will water once a month in winter.